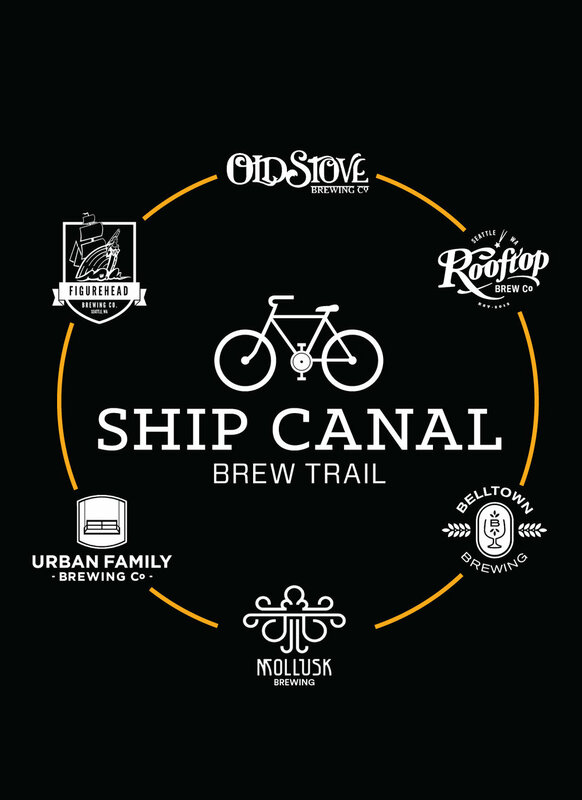 In what might be the Cycling Cicerones most important achievement to date, we worked closely with area brewers to create the Ship Canal Bike and Brew Route. What once was merely a map on a page now is tangible. Some might say beer is a reward in itself. A mostly intersecting group of people would say that biking is its own reward as well. To all that, I say nay! Biking and beering can be even more rewarding than that! And what is more rewarding than broadcasting your achievements to your friends? Nothing. So, like the “marathon finisher” medals that came before it, I present to you the Beer is Better With A Bike/ Ship Canal Bike and Brew Prize! Some cautions and disclaimers before I go on: please ride safely. Riding a bike while drunk is not advisable and you could hurt others, yourself, and your bike. Pace yourself, that is, your drinking and your speed. Wear a helmet. Gets lights. And for Armstrong’s sake, learn to signal. I’m about to suggest 6 breweries you can visit on your bike. What I am not suggesting is visiting 6 breweries in a single day on your bike. Don’t even try it. I max out at three and I like to believe I know what I’m doing. Sorry about that. Now, onward. A super soft black tee presents the dizzying (hopefully not literally, but perhaps) array of breweries you visited while proclaiming that beer is better on a bike! Pick up a punch card at any of the 6 participating breweries. At each brewery, receive a punch for your card by buying a beer or filling a growler. You can get only one punch per day at any given brewery, so you’ll have to come back again later, but there’s nothing stopping you from going to the next place on the route to grab another beer and punch. When you’ve completed your epic quest and filled out the whole card, 2 punches per brewery, 12 punches in all, you can redeem the card at any of the 6 locations for your t-shirt. Obviously, this is only while supplies last, so get out there and start punching away. Longtime readers of this blog will know the Ship Canal Trail by now. It’s one of my favorite trails in all of Seattle connecting breweries via the train track crossing, semi-industrial, semi-marine bike and pedestrian pathway. It’s rarely crowded and travels east to west, north of Magnolia and south of the canal that connects Lake Union to the Sound. By itself, it reaches three breweries: Rooftop, Figurehead, and Urban Family, which alone makes it great, but it gets better. It connects to the West Lake Bike Loop on its east end and the Interbay/Elliot Bay trail on its west. Both of these bikeways are bike express lanes straight to the breweries in the city around Belltown. Westlake trail leads to Mollusk/Dexter Taproom and Interbay leads straight to Old Stove, even passing a couple other breweries on its way. Nestled between these two is Belltown Brewery. The breweries naturally form two separate groups: the city breweries to the south, and the industrial breweries to the north, both connected by the beautiful hill-less bike paths that circumnavigate Queen Anne hill and showcase the waterfronts that they run along. The city breweries tend towards brewpub. They are hustle and bustley and overflowing with energy. The northern breweries are the perfect place to let your Seattle Freeze thaw over a flight of perfect beer. Frequenters of either set will find as they explore a new area a distinct style and energy that is unique to the other. That is what exploring is all about, but you never needed a shirt to tell you that. You can go about these breweries however you like, but the Cycling Cicerone suggests starting in the city at Old Stove and going clockwise around the loop, which would take you about 60 minutes if you never had to stop for beer. Second Ave downtown is more forgiving to those traveling south when heading to Old Stove and heading north on Western Ave is easy when heading to the Interbay trail. Almost all of the path is on bike trails through Westlake, Interbay, and Ship Canal, and what is not is on dedicated bike lanes in the city. If the high stress of city biking isn’t for you, and it sure ain’t for me, then don’t worry this is a great way to try it out. To repeat and expand on my disclaimer above, ride safely. City riding is a pain and may put you in the way of angry drivers who take their anger at traffic out on bikers. Avoid biking to a city brewery towards the end of your day of drinking if you aren’t experienced in city riding. I’ll repeat this too, capping at 3 breweries with one beer at each is the safe way to ride. If you wouldn’t drive, you shouldn’t bike. Sorry again, moving on. Mollusk, Belltown and Old Stove breweries in the south all offer food. Both Mollusk and Belltown are full sit down ordeals with tables, hosts, waiters, and the works. Old Stove offers a small menu of snacks like Bavarian pretzels and sausages. Starting at one of these places to get some food to line your belly is a delicious and smart choice. That’s not to say the three breweries up north don’t have food. Urban Family, Figurehead, and Rooftop all offer snacks in the form of pretzels or popcorn and have takeout menus from local restaurants all available, as well as frequent food trucks. Keep all this in mind as you plan your trip. Get there and ride. Spread the bike life. Beer is better with a bike. Hoo-rah!